NEXT 20/20 is an initiative to cultivate 20 new musicals, or plays with music, over a five-year period. This initiative comes from the belief that it is the responsibility of the regional theater to not only speak to audiences today, but to contribute to the dramatic canon of tomorrow. 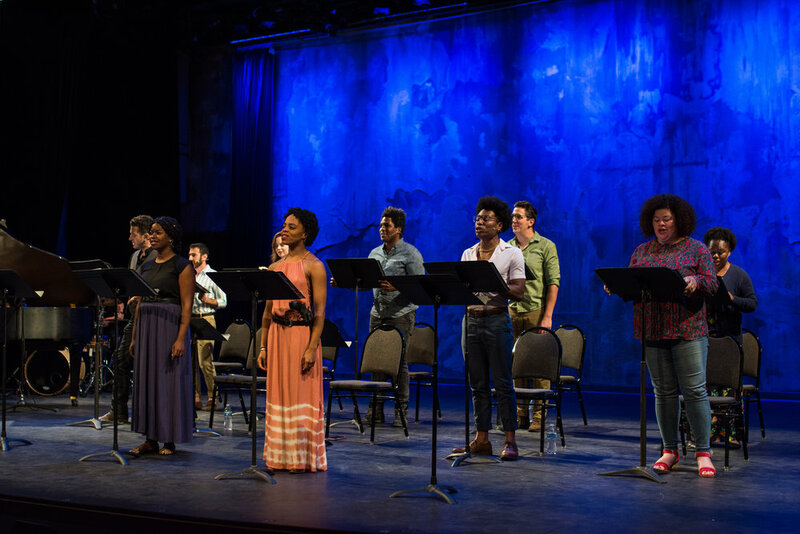 With NEXT 20/20, Theater Latté Da will invest in the future of the great American Musical and its playwrights, composers, and lyricist through our annual NEXT Festival and world premieres. The 20th Anniversary season contains the company’s most ambitious world premiere to date, Five Points by Harrison David Rivers, Ethan Pakchar, and Douglas Lyons, directed by Peter Rothstein. We truly cannot achieve this ambitious goal without the help of our community. We believe passionately in the future of musical theater, and know that you do too. Help us set the stage for the next generation of great musical theater writers and composers so that we might continue to capture the hearts and minds of audiences for generations to come. Please consider supporting new work through giving to NEXT 20/20 in addition to your annual fund gift. Thank you to the following individuals and organizations or institutions for their commitment to new work through supporting NEXT 20/20. David Young and Edward Williams, Jr.
For details on how you can participate in this ambitious initiative, please contact Michelle Woster at 612-605-1771 or michelle@latteda.org. The NEXT Festival is Theater Latté Da’s New Work Festival showcasing three works that stretch the boundaries of musical storytelling. Each show in the Festival receives public performances providing audience members the opportunity to get in on the ground floor of the creative process. Lamar Jefferson as Willie Lane, photo credit Dan Norman, 2018. Theater Latté Da's most ambitious musical world premiere to date brought together the talents of a dynamic creative team. The score is the work of Douglas Lyons and Ethan D. Pakchar, a New York-based songwriting team with significant Broadway credits. The book is written by the prolific Twin Cities-based playwright Harrison David Rivers. FIVE POINTS premiered in Latté Da's 20th anniversary season in March 2018. KENDALL ANNE THOMPSON, DAVID DARROW, AND BRADLEY GREENWALD IN C. PHOTO BY DAN NORMAN, 2016. With book and lyrics written by Bradley Greenwald and music by Robert Elhai, this new musical adaptation of Edmond Rostand’s great play, Cyrano de Bergerac, reminds us of the power of language and gives new voice to one of its greatest champions. Cyrano is a brash, strong-willed man of many talents. He’s a remarkable poet and a consummate musician who is deeply in love with the beautiful and intellectual Roxane. However, he is plagued with persisting self-doubt because of his extremely prominent proboscis. C. debuted at the Ritz Theater in Northeast Minneapolis in March of 2016. DAVID DARROW, ADELIN PHELOS AND ANNIE ENNEKING IN LULLABY. PHOTO BY GEORGE BYRON GRIFFITHS, 2016. Lullaby is a new play with alternative rock music that’s powerful and absolutely beautiful. In addition to original music from Michael Elyanow, the production features the music of national recording artists Garrison Starr and Chris Dallman. In hopes of learning to play lullabies for her infant son, a widowed young mother seeks guitar lessons from a once almost-famous rocker. As the two very different women bond over tricky chords and haunted pasts, a hilarious and moving story of friendship and forgiveness emerges. Lullaby received its world premiere in 2016 at the Ritz Theater in Northeast Minneapolis. BRAXTON BAKER IN STEERAGE SONG. PHOTO BY MICHAL DANIEL, 2011. Created by Artistic Director Peter Rothstein along with musician and writer Dan Chouinard, this musical docudrama tells a story of the journey immigrants took from Europe to America through Ellis Island. Rothstein and Chouinard spent over three years gathering immigrant songs from 30 different European countries then narrowed their selection to 40 songs. The production includes lyrics in 15 different languages, but the driving force is the universal language of music. Providing a context for the music are quotes taken from immigrant guidebooks, Ellis Island documents, immigration legislation, and articles about life in New York’s Lower East Side tenement district. Steerage Song received its world premiere in 2011 at the Fitzgerald Theatre in partnership with Minnesota Public Radio. New partnerships are being formed to allow Steerage Songto live beyond its premiere. CAST OF PASSAGE OF DREAMS. PHOTO BY RICK SPAULDING, 2009. Theater Latté Da took musical theater to new heights—literally—combining intriguing stories, compelling music and the art of aerialism in this triptych of new musicals. The production was created in collaboration with New York-based team Katie Baldwin Eng, playwright, and Jeff Tang, composer. The production was comprised of three short musicals, Passage of Dreams, Thirst and Bessie’s Birthday, all commissioned by Theater Latté Da and New York University’s Write/Act Festival. Passage of Dreams was developed at The Playwrights’ Center as part of PlayLabs in 2006, and had several workshops and readings in Minneapolis and New York. The Southern Theater run in 2009 marked the first time the works had been fully realized, demonstrating Theater Latté Da’s commitment to the development and production of new musical works. DAVID ROBERTS WITH GARY RUSCHMAN (LEFT) AND ADAM REINWALD (RIGHT). PHOTO BY GEORGE BYRON GRIFFITHS, 2010. In developing All Is Calm, Artistic Director Peter Rothstein wanted to create a work for the theater where the content dictated the form. In 1914, radio was the primary communication tool, so Rothstein conceived All Is Calm as a radio-docudrama. All Is Calmtells the story of the Christmas Truce of 1914 in the words and songs of the people who lived it, with dialogue created primarily through found text from letters, official war documents, autobiographies, World War I poetry, grave stone inscriptions and even old radio broadcasts. Because theater is an art form that asks audience to engage their imagination to complete the story, Rothstein created a rich audio experience, and left the visual world up to the audience to imagine. The music was re-arranged for the production by Erick Lichte and Timothy C. Takach of the vocal ensemble Cantus. In 2007, All Is Calm premiered at three Twin Cities churches in collaboration with Cantus. The world premiere was also broadcast live on Minnesota Public Radio and was heard worldwide through live streaming. The broadcast has since been aired each year locally, nationally and even internationally through American Public Radio. In 2008, Cantus and Theater Latté Da teamed up with Hennepin Theatre Trust to present All Is Calm at the Pantages Theatre. All Is Calm has since become a holiday tradition being performed annually at the Pantages and on tour throughout the country during November and December. TOD PETERSEN AND THE CAST OF A CHRISTMAS CAROLE PETERSEN. PHOTO BY RICK SPAULDING. In 2000, this holiday favorite received its world premiere at the Loring Playhouse in Minneapolis. Written by Tod Petersen and Peter Rothstein, A Christmas Carole Petersen is a lively musical that speaks to the power of the holidays to bring out the best and worst in all of us. Tod Petersen, acclaimed for his hilarious and moving performance, reflects on the Yule season with his family and in particular, the show’s namesake, his mother Carole. Elements of Christmas kitsch, nostalgia and music blend to remind us of the traditions and rituals that shape a family, as a Minnesota son struggles to rediscover the magic of the holidays. A Christmas Carole Petersen was presented for seven seasons at the Loring Playhouse before moving to the Ordway Center’s McKnight Theatre in December of 2007 and 2008.